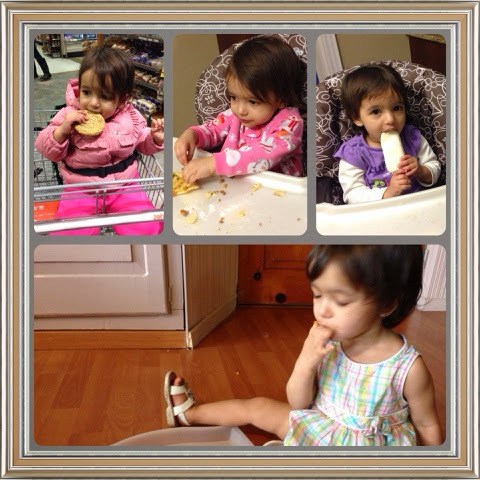 While I was checking my photos to select ones for everyday in 2014, I realised that many, many, many of them are with little A eating something or the other. 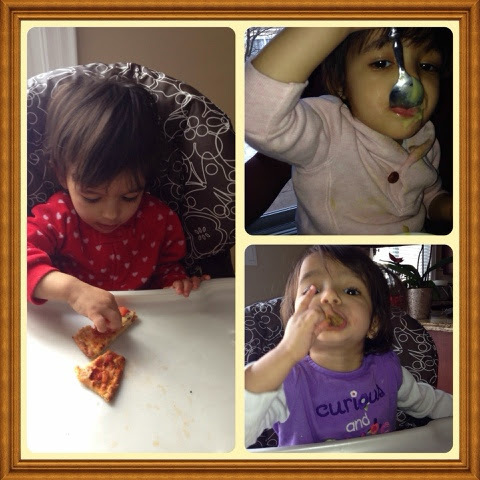 This kid loves her food and she eats all day. Case in point. These are pictures I already posted on the blog. 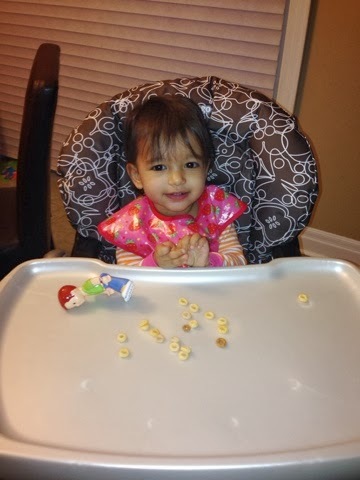 Cheerios first thing in the morning...before breakfast.... just to tide her over. From the minute she gets up, this kid is ready to eat (after brushing her teeth of course- sidenote, she has such straight teeth, I think it looks like little baby veneers). First of all, I sneak fruits, seeds and veggies into our smoothies daily. But from the bland and regular like buttered toast and cheddar cheese to the weirdly texturized chapchae noodles, kale salad, scallops and jumbo shrimp, this kid will try it all. She is also interested in whatever is on my plate. Sometimes, she is done after a few bites but most times she would have her fair share. 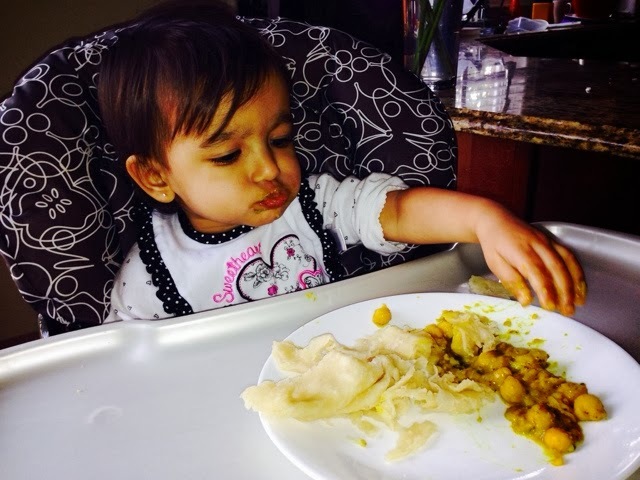 She loves her fruits and veggies but also loves her kurma and doubles. I'm never worried when we try a different restaurant, as I know there will always be something she can eat. This pleases me to no end. 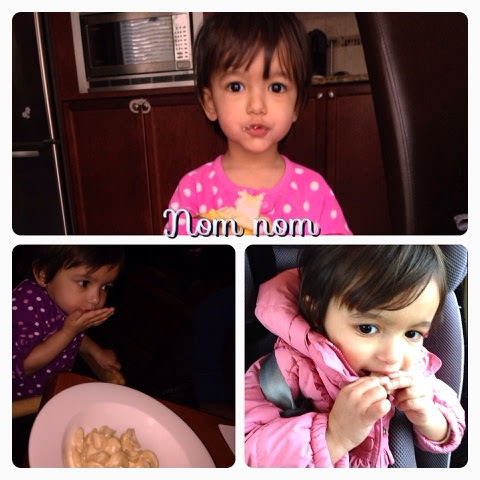 I've always wanted my kids to be adventurous eaters the way D and I are. I put a lot of thought into what I give my kids to eat. We make sure that protein, complex carbs, fruits and veggies are on their plates every day but I also don't dumb my cooking down to cater to a simple palate. Though I believe kids have delicate palates, I think it's my job to introduce them to new and different spices, tastes and textures within reason.. Granted, I don't add any peppery ingredients into my cooking, but other than that, I'm adventurous within reason. I also tell my kids, well Cassia really, that I am not a short order cook. She has to try whatever is on her plate. I also make sure there is fruit, washed, sliced and in a bowl on the kitchen counter for them to nibble on afternoons. This I think helps cut down on our refined sugar intake in this house.